SRA Softtech Pvt Ltd, a company owned by Pollyana Patel, has just launched a new app, Saavadhan, that allows you to track someone. And not just for the paranoid parent either but for employers, shop or restaurants owners who are keeping an eye on competing enterprises and customers this one takes keeping tabs to an all new level. a�?You can track your family and friendsa�� exact location from your mobile phone or a web portal,a�? begins Pollyana, adding, a�?or even multiple groups. In fact, my husband was tracking me when I went to Delhi and until I touched down in Dubai.a�? Once you download the app and register, youa��ll be allowed to create groups ofA� friends or family. Then send out invitations to people through email addresses and when theyA� accept, they become part of your group. Tap on a check box to trace their location. An Emergency Group, is also part of the app, which includes people you pick to come to your rescue with a simple tap of the SOS button. There is also a panic button toA� speed things up. a�?They will know your exact location. We can also link this to the emergency services so that they can come to your aid with no need for a phone call. It even tells the person under attack or the victim of an emergency where the help will be coming from,a�? Patel tells us. 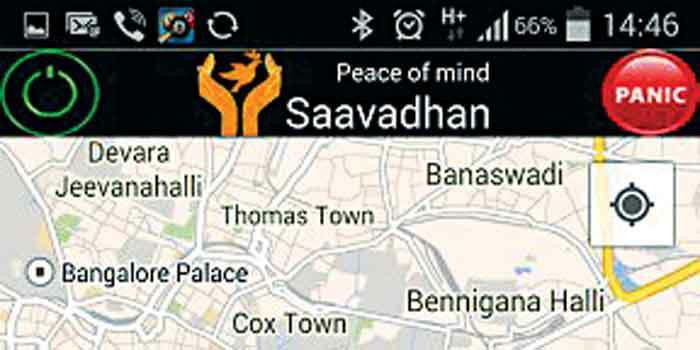 Saavadhan is one of the few apps which can track globally. We love the Geo-Fence feature which enables you to select a location and put a fence around it. a�?For example, a school, an office, a home, or a place where you get together with friends, it can be anywhere in the world, and you can receive alerts when your selected contacts move in and out of that location,a�? explains Patel.